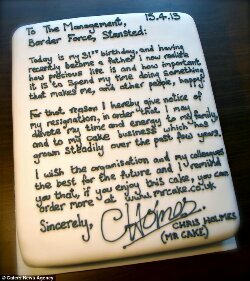 Have you ever wished you could just quit your job and bake cakes? I know I have! Unfortunately my piping skills aren’t that good so I’d probably just write “So long and thanks for all the fish” and run out of the door. Hopefully with this publicity his business will be a success as its always nice to see people become successful at their dreams…it gives me hope. Next postThere must be an Olympic sport for how fast small children move?